New Hampshire became a state June 21, 1788, the 9th state admitted to the Union. New Hampshire became a state in 1788, but its capital was in dispute for the next 20 years. The state house was begun in 1808 and finished in 1819. It is built of some of the granite New Hampshire is famous for. 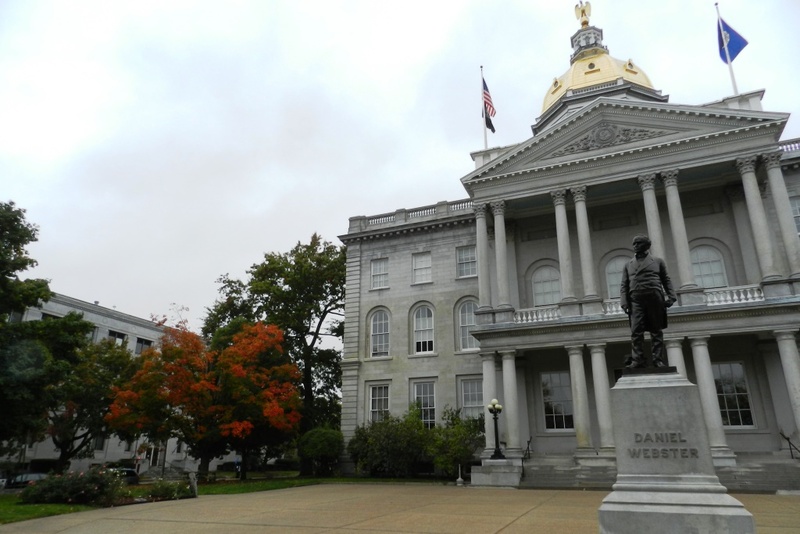 New Hampshire’s legislature is the largest in the country – more than 400 seats. Canterbury Shaker Village is in Concord. Also the Christa McAuliffe Planetarium, a memorial to the nation’s first teacher in space. There is skiing nearby, in the White Mountains. You can ride to the top of Mt Washington on a cog railroad. Robert Frost wrote most of his poetry when he lived at Franconia, just to the north. Children dancing on the capitol square during festival time; the footprint left by Robert Frost; the stone walled farms and paths through snowy woods, the hardy granite soils and souls; the wind and rain and bottom-line tenacity. Mountains near: White Mountains. Mount Washington, in the northern part of the state, is the highest point in New Hampshire at 6,288 feet.